Attention: Universities, Organizations, Companies can have annual subscription for their staff. 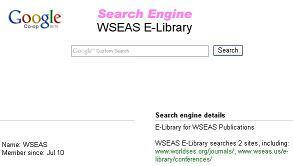 In this case, you do not need username/password, simply visit the link: http://www.wseas.org/rss/isp-free.asp and you will enter the WSEAS on-line Library automatically and without any username/password. If your University has not access in the WSEAS E-Library yet, contact us now and we will be glad to give our offer for your university annual subscription. All WSEAS members , all WSEAS authors and co-authors that have published papers in the WSEAS journals, books, conferences (since 1996) have a username and a password. WSEAS Authors: For authors, the usernames/passwords are also valid for 12 18 months now. After their expiration, you must publish a new paper in the WSEAS to obtain a new username/password. Usernames and passwords are given to each author after his registration in any WSEAS conference.